Per Amazon the Ameriglo CAP sight is "a high visibility, low profile sight system designed for personal security situations. 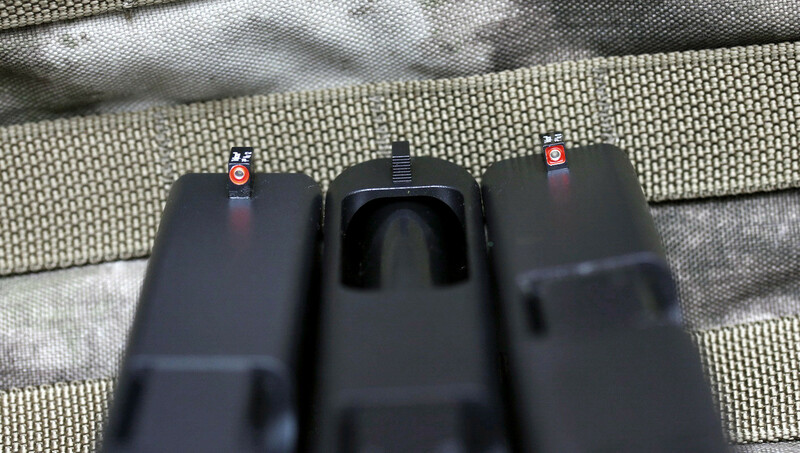 Designed by retired law enforcement officer, author and combat pistol instructor Dave Spaulding and AmeriGlo's Rick Callihan: The CAP sight enables shooters to reference their front sight even in times of high stress like armed conflict. The front sight is a combination of tritium (by Trijicon) and a phosphorescent paint which is a very bright orange in the daylight and the tritium glows green at night . 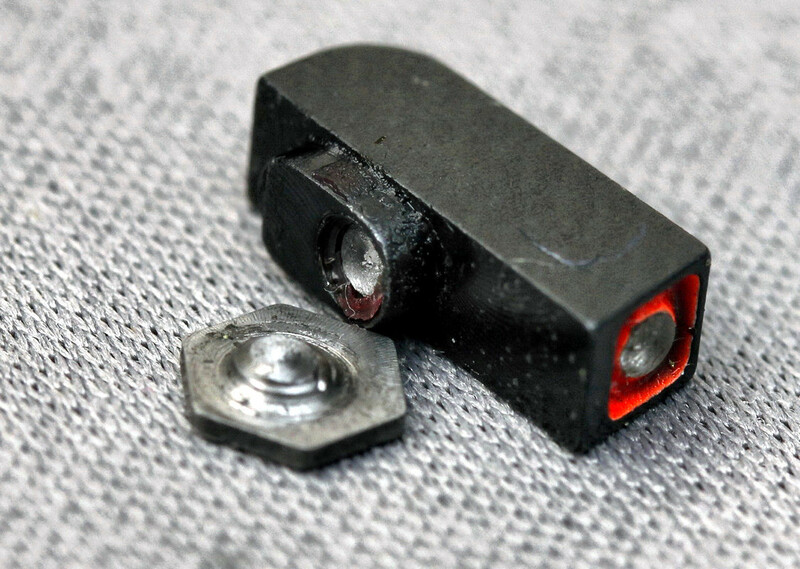 The rear sight is an affective notch-style with a slightly wider and deeper notch than on a stock sight. 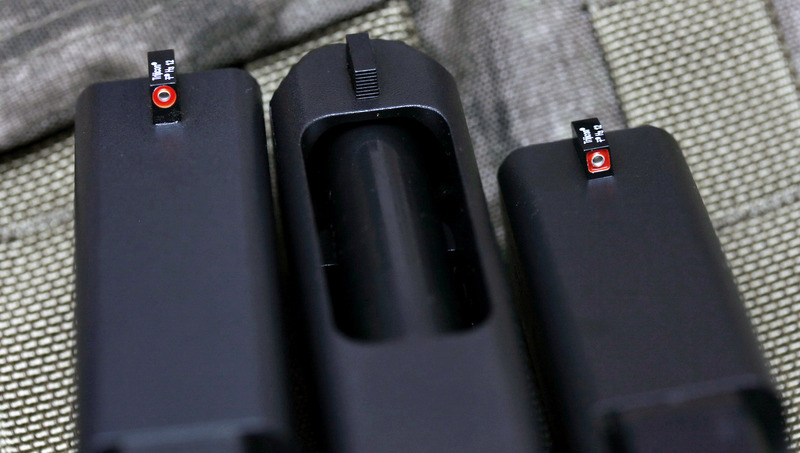 The Rear sight ihas a line that is a phosphorescent paint. No tritium on the rear sight. 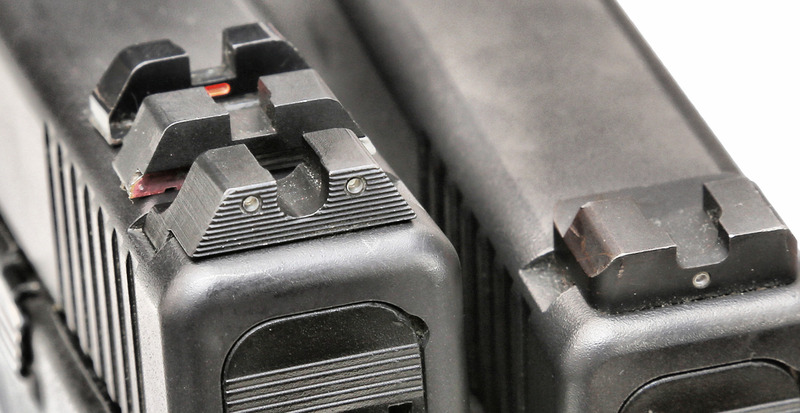 At close range, the shooter needs to place the front sight in the rear window and press the trigger. For precision shots, place the orange square on top of the orange sight line for instant alignment. The sights are kept as close to the bore line as possible for faster visual access. Fast and highly visible, the shooter covers what they want to hit, which simplifies sight picture / alignment." Per Amazon the Ameriglo Defoor Tactical Sights have a "Fixed flat-black rear sight w/serrated front. Are Ideal for Competition. Front sight width is .115" and .150" rear sight notch"
Per Amazon the Ameriglo Pro-I "features a .180" squared rear notch. Rear extend to end of slide and has an under-cut face to eliminate glare. Front sight has a .140" wide front sight." I purchased the each one of these Glock sights specifically for EDC carry. I ordered the CAP sights for my G26 to use as a "big, easy front sight" to pick up on a carry gun more than a year ago. I have had the Pro-I Dot sights for the better part of 3 years, I have gone through several sets of them, on my carry guns, HD gun and training guns. I picked up the Ameriglo Defoor Sights in 2012 and have had them on various guns, from my EDC G19 to my G17L. I bought the Defoor sights after seeing a video of Kyle Defoor talking about them and I decided since I do a lot of 25 yard line shooting I should pick them up. Why am I sticking with Ameriglo sights? Specifically because I believe they are very cheap for what you get, but fall slightly short of my EDC Trijicon HD Yellow Front Sight. I did purchase Ameriglo Suppressor Height Sights for my RMR Project which I kept on the G19 when I sold it. The Pro-I Dot's were the first Ameriglo sights I purchased. I installed them on my G19 and was happy with what they did. At 25 yards, the ability to cut the target in half with the front sight ledge works really well and that is something I really enjoy about these sights. The rear dot and front dot have a nice glow in dark environments and did exactly what I needed them to do. The CAP Sights were purchased for the purpose of EDC on my G26, but I ended up installing them on my EDC G19 specifically because I wanted to try a different sight setup. The big square dot works really well for "flash sight picture" and it is a very big sight so close up you are able to pick it up quickly during presentation. 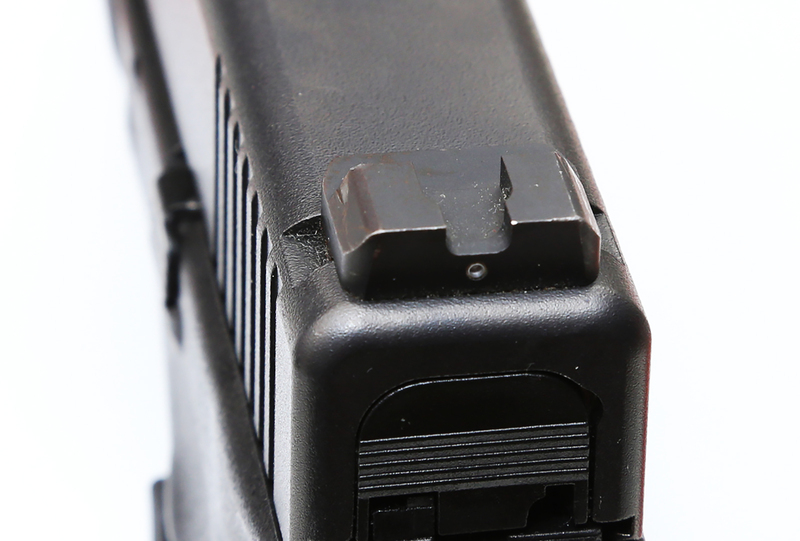 For accuracy the rear sight has a red line in it to align the front square sight with. It works well enough but is not as accurate as the Defoor or Pro-I Dot sights. The Defoor Ameriglo sights I installed on a G34 I had at the time. The longer than average barrel plus the thin front sight provided for a very specific advantage to accuracy. The Defoor sights are very accuracy based sights, they are similar to the Pro-I Dot's in that you can cut the target in half with the front sight post at 25 yards for accurate fire. These sights were not designed to be used in low/no light as stand-alone sights, Kyle Defoor said during a class that you have a flashlight for a reason. About a month after owning the CAP sights the above happened. I was at the range doing some training and the front sight looked slightly canted to the right and accuracy was garbage. I touched the front sight post and it came completely off. I was surprised but not super surprised as I have had issues with a set of Pro-I Dot sights during a class. I emailed Ameriglo's customer service and they sent me a new front sight post and screw without issue. Once they came in I installed them on a G17L. 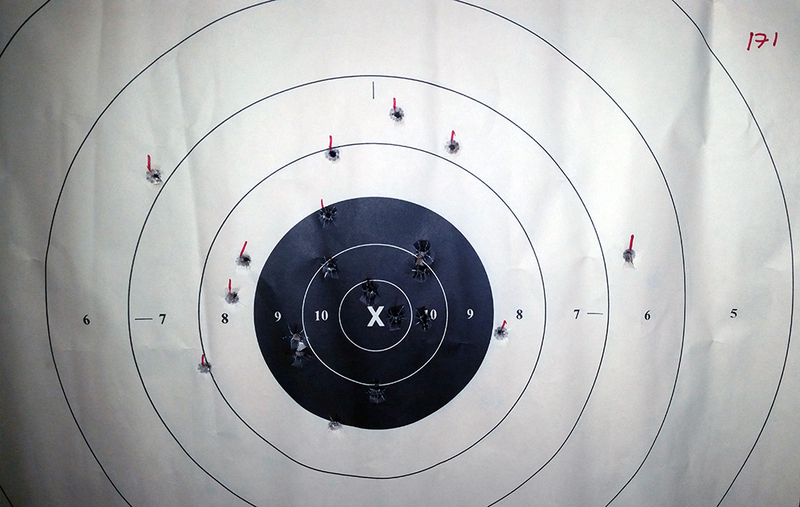 The above is a 200 drill I shot with the CAP sights installed on a G17L, I shot the above right after I zero'd the gun. 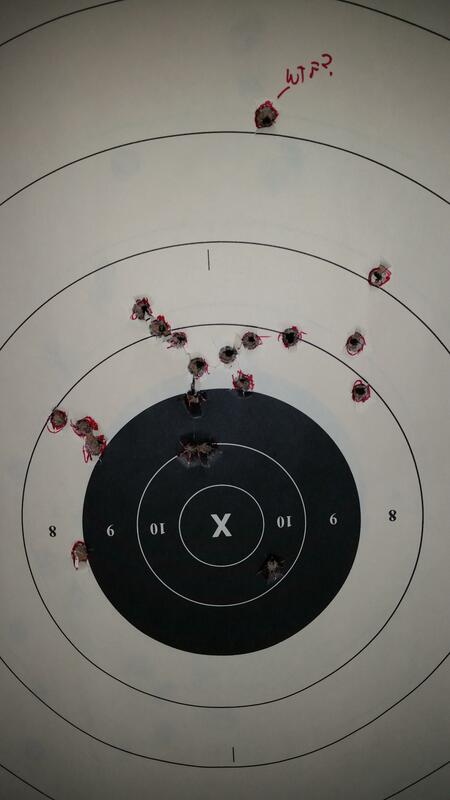 I was aiming center of front sight ledge at 25 yards, so it shoots a little high due to the size of the sight. Yes I threw one, but don't worry about that little guy. The Pro-I Dot sight was my default sight of choice, I carried it on my G19, my G26 and my HD G17. I had the Pro-I Dot on my G19 for about a year and during a Warrior Pistol Class I ripped the rear sight off during a Farnham drill (not a video of me ripping the sight off, didn't take photos of it). Thankfully I had a backup (everyone should) and used that the rest of the class. I re-installed the rear sight with some red loctite and it did not move on me again. After a few more months of hard use I did end up walking loose the front sight of that same set of Pro-I Dot sights. I do not know if it was a bad batch that was out of spec slightly but I had some issues with it. I still have them on my HD G17 and they do work well. Above is a 200 drill I shot after I installed them on my G17. I was cutting the target in half with the front sight ledge. The Defoor sights went from a G34 to a G19 to a G26, back on my G34 and ended up on a G17L. I used them as a benchmark for accuracy. Everyone that shot the G17L (or the G34) with the Defoor sights boosted their 200 drill score by a few points, sometimes by 20% depending on if they jumped platforms. (1911/SIG to Glock in a few instances) These are the sights I have had very little issues with and have beaten up the most. They are the default for accuracy tests if I am at the range and having an issue with a gun, I'll grab a gun with the Defoor's installed on it and shoot the same drill to see if it is me or the gun (because its almost always you) except those few time when its not. The black outline and thin ridged front sight really work well, no complaints. The CAP sights are very big and not very accurate at distance, but of course part of the accuracy issue could be the user. I used them in a walk-back drill and only made it out to about 70 yards, or so and could not find the right height to hold over. Up close they are good as far as flash sight picture and acquisition during draw. I would say that they were slightly faster than the Pro-I Dot's in terms of fast and on the move shooting, specifically one shot from draw, but fell short on the pinpoint accuracy needed for hostage target drills. I have owned the CAP sights for almost two years and have used them for thousands of rounds on various Glock 9mm pistols. The Defoor sights are basically the "accuracy standard" in my opinion. The biggest drawback to them is that they have no low/no light usability without an external light source. I mean, sure you can always use the Sonny Puzikas method, or as Kyle Defoor said, you carry a flashlight for a reason. My personal requirements (as well as the requirements of my employer) call for a night sight of some kind. So the accurate sights are on the shelf for now. I found them to be slightly slower than colored front sights during one shot from draw, but that could be because I have the least amount of time on these sights. They are faster/more accurate on hostage targets, or other drills that require fast accuracy at speed. I have owned the Defoor sights for a little over two and have years and have several thousand rounds through them, mainly on a G34 or G17L. The Pro-I Dot's were my EDC that were dethroned by the Trijicon HD's. The Pro-I Dot's have the center of front sight ledge aiming that I like and even close up you can still use that method with relative success. They are marginally slower than the CAP sights at speed shooting and sight acquisition during presentation, they are however much more accurate than the CAP sights at accurate shooting while shooting quickly. The Pro-I Dot sights are the median between the Defoor and CAP sights in my opinion. I have owned several sets of Pro-I Dots for a little longer than four years and have more than ten thousand rounds through various Glock 9mm pistols with them mounted. Of the three sights reviewed above I still have two sets of the Pro-I Dot's installed on two pistols. That said for about half the price of the Trijicon HD's you are getting a pretty solid sight. Alternatives to the Pro-I Dot's are Trijicon HD's. You can always go for their Spartan setup which is basically the Pro-I Dot front sight with a double tritium rear (emulating the Trijicon HD's). The XS Big Dot's are also a good alternative since they have very similar features and setup. 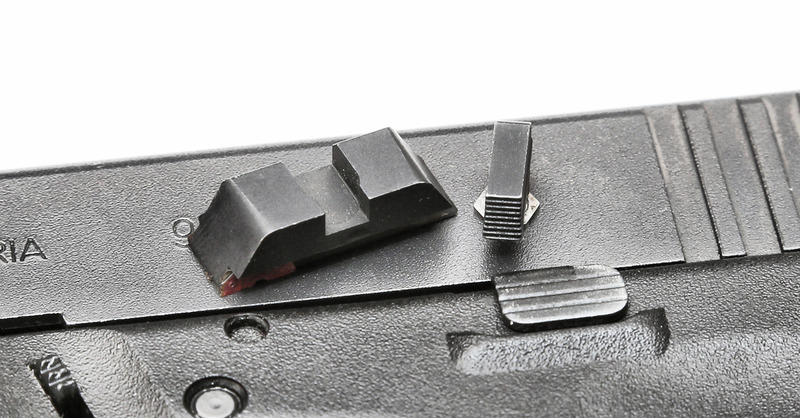 The CAP sights are in a specific or "niche" section of pistol sights. They are massive and allow for good pickup at speed but have issues otherwise. I would recommend them for an HD gun after a good bit of work and confirmation of zero. They are big enough to pick up during a panic state. They also come in green instead of red. The biggest competitor to the Defoor sights are the Heine SlantPro, though they have tritium and are slightly thicker, they offer the same style of sight. Of course you can always go for a fiber optic sight like Warren Tactical or Zev-Tech's Fiber sight. But you will be hard pressed to find a sight for the same price that will beat it in accuracy. Just a note about my experiences with the Ameriglo sights and them breaking. Yes, I have had sights break on me, and more than once. 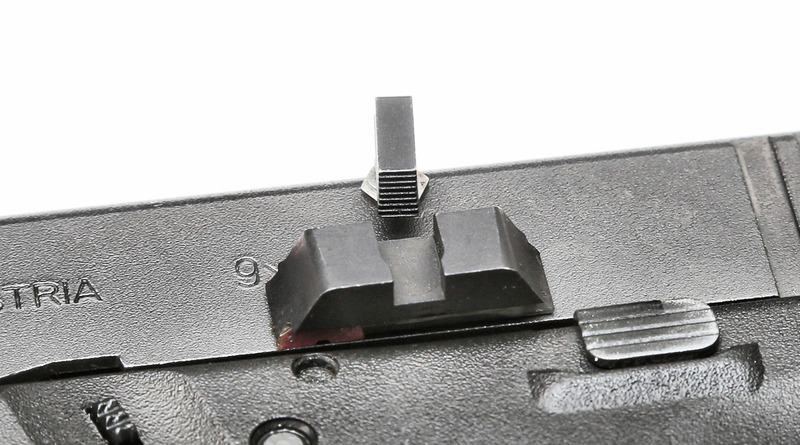 From the front sight post falling off to coming loose to the rear sight coming completely off during hard use, Ameriglo has been very responsive and quick to replace any issue I had. It is the reason I went with them for suppressor sights for my RMR project and will probably buy from them again in the future.